The next fall, Michael is in America for a meeting and decides to use the opportunity to meet the Jewish daughter who survived the church fire. On his way to New York, where the woman lives, Michael finds himself dreaming about what his and Hanna’s life might have been like if they had stayed together. When he wakes up, Michael knows Hanna is dead and longs for her. Now that Hanna is gone, Michael finds that his old longing for her has returned. His dream about what his life might have been like with Hanna is perhaps one of the unfulfilled expectations to which he referred in Chapter 9 of Part 1. When Michael arrives at the Jewish woman’s apartment, she serves him tea. The narrator describes her as “matter-of-fact” in both tone and appearance. When the woman asks him why he came, Michael tells her about Hanna’s wish to give her the money. However, the woman refuses, believing that to accept it would be to grant Hanna absolution. The woman’s demeanor is much like the analytical numbness “exuded” by her book. Her refusal to grant Hanna absolution, combined with her “matter-of-fact” tone, suggests that some crimes are so horrible that they cannot be forgiven. This is a crucial moment in the book, as the woman takes a moral stand against offering any kind of forgiveness for Hanna. Michael asks the Jewish woman if she can accept the money without granting absolution, and the woman, laughing, probes Michael about his relationship with Hanna. Michael tells her about his teenage affair and about Hanna’s illiteracy. The woman calls Hanna “truly brutal,” as Michael was only 15, and asks him if he felt that Hanna knew what she had done to him. Michael evades the question, but tells the woman that Hanna had known what she had done to the camp prisoners. Though Michael refused to divulge his relationship with Hanna to the warden, Michael now tells the Jewish woman about his teenage affair, perhaps in an attempt to fulfill Hanna’s last wishes (or to connect with another person whose life was greatly altered by Hanna, although in a very different way). Like Michael himself, the woman wonders if Hanna knew how much pain she caused, but Michael instead tells her about how Hanna had taught herself about the camps in order to demonstrate Hanna’s remorse. When Michael takes out the tea tin and a check, the Jewish woman leaves the check on the table and empties the tea tin. She tells Michael that as a little girl, she had a tea tin for her childhood treasures, but that the tin was stolen from her to be used by the concentration camp. The woman decides that Hanna’s money should not be used for the Holocaust, as that would grant her absolution, and Michael suggests that the money be donated to a Jewish organization dedicated to illiteracy. The woman leaves to Michael the responsibility of choosing an organization and donating the money, and decides to keep the tin. Though the woman insists that Hanna’s money not be given to Holocaust organizations, she leaves open the possibility of Michael donating the money to a Jewish organization—an investment in the future, rather than an attempt to erase or smooth over the past. The woman’s decision to keep Hanna’s tin perhaps symbolizes her reclamation of part of what she had lost in the camps—a small act of asserting her agency and personhood in the face of the Holocaust’s enormity. Like the Nazis’ theft of her own tin and rejection of her childhood treasures, the woman keeps Hanna’s tin and rejects its contents, thus again rejecting any absolution for Hanna. 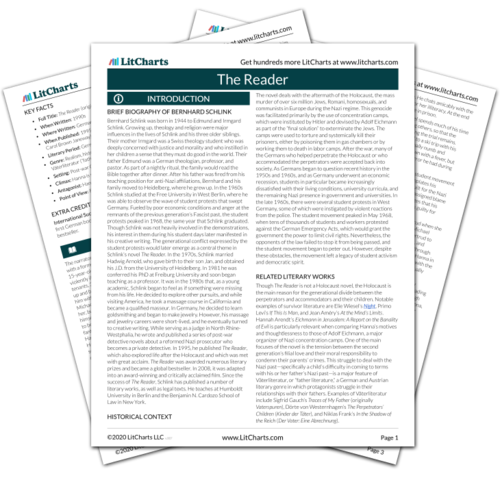 Get the entire The Reader LitChart as a printable PDF. Lee, Sophia. "The Reader Part 3, Chapter 11." LitCharts. LitCharts LLC, 9 Mar 2017. Web. 18 Apr 2019. Lee, Sophia. "The Reader Part 3, Chapter 11." LitCharts LLC, March 9, 2017. Retrieved April 18, 2019. https://www.litcharts.com/lit/the-reader/part-3-chapter-11.